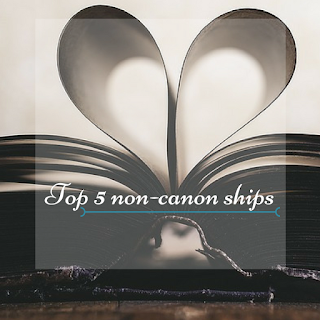 What are some of your favourite non-canon ships? Fun question! Neville and Luna is my favorite non-canon HP ship. Sorry, I can't get into Hermione and Draco at all. And I actually treasured the platonic Harry-Hermione relationship as a terrific example that you can be best friends with someone of the opposite gender without it ever having to get romantic/sexual. I don't think there's enough of that, in real life or in fiction. Other non-canon ships for me? 1) Kel and Dom, in Tamora Pierce's Squire and Lady Knight. There are hints it might happen eventually, but so far, they're just friends. 2) Sherlock Holmes & Irene Adler, the woman who bested him, once. I'm talking original stories, not the Benedict Cumberbatch series (I love that version, but can't see his Holmes & that Irene Adler together.) There are some stories that have played with this possibility; I think Laurie R. King did it best in The Language of Bees. 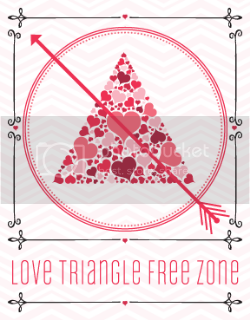 BTW, I love your "Love Triangle Free Zone" button. I'm so fed up with those, especially if they're just an easy way for the author to introduce some tension, rather than truly important to the plot.